The free visual resource management tool helps teachers, schools and districts keep the overview and maintain control of their resources on any device. Today Symbaloo released their anticipated web app for iPad. Symbaloo immediately detects that a user is accessing the system via the web browser of a mobile device and will automatically display the appropriate interface. 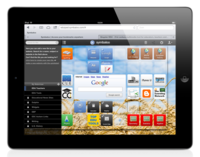 As with the other Symbaloo apps, a user’s settings are saved in the cloud and synchronized across all devices including the new iPad web app. “The technology is ready for all resolutions and screen sizes, so if Apple is ready to bring an iPad mini on the market, our technology is ready for it!” declares Koen Dantuma, head of technology at Symbaloo. With the introduction of the iPad web app, Symbaloo provides schools the freedom and flexibility they need with mobile learning. Symbaloo is the first resource management system that offers schools a multi-device solution for saving resources in the cloud and the ability to access from any location. As long as Internet connection is available the resources are at their fingertips. The app allows teachers and students access to their resources from any device. With programs such as 1:1 and BYOD (bring your own device) there has been an increase of digital tools and devices in the classroom making the need for structure necessary. 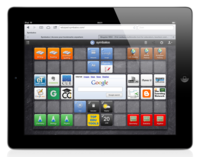 The iPad web app joins the list of apps that Symbaloo has already made available thus providing students consistency regardless of the device they are using: Android phone, iPhone, iPad, Mac or PC. “iPads are becoming increasingly common whether at home or in the classroom. Since the introduction of SymbalooEDU last year, teachers have been begging us to bring an iPad optimized version for classroom use. We are proud we are able to support them now!” states Kimmie Chann, Community Manager for Symbaloo. Due to the many budget cuts many school districts see a BYOD or BYOT program as the alternative way to introduce technology into the classroom. For many students who currently have multiple devices and are using technology in their homes this will be a welcome transition. Symbaloo is bridging the gap between technology use in the home and in the classroom. "With the introduction of the iPad version, Symbaloo has taken the next step in making all of your resources accessible from any device," Klaas, CEO of Symbaloo.